The film picks up six months after the Rage virus has spread throughout the city of London. The United States Army has restored order and is repopulating the quarantined city, when a carrier of the Rage virus enters London and unknowingly re-ignites the spread of the deadly infection, wreaking havoc on the entire population. The virus is not yet dead, and this time it's more dangerous than ever! $5.454 million on 2305 screens. In 2003’s 28 Days Later, we saw an England decimated by a vicious virus that causes its victims to turn into blood-spewing monsters. 2007’s 28 Weeks Later follows up to show us what happened after the end of the first flick. Soon after those events, Weeks shows us a handful of still-human survivors who hole up together in a house. 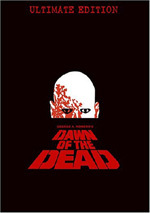 After they take in a young boy (Beans Balawi), the semi-zombies come after them and drive them from the abode. Don Harris (Robert Carlyle) abandons his wife Alice (Catherine McCormack) and the boy to flee the monsters. Once he gets away, we see text that tells us that after 28 weeks, Britain is allegedly free from infection and the reconstruction has begun. NATO forces led by Americans police a pretty deserted London as the authorities slowly let Brits re-enter the country. 12-year-old Andy (Mackintosh Muggleton) and his teen sister Tammy (Imogen Poots) come back to reunite with their dad – none other than Don, who now acts as one of the main supervisors of the “safe zone” facilities, and who also doesn’t tell his kids the truth about what happened to their mom. Against orders, Andy and Tammy slip into the quarantined zone so they can go to their old house and get some items. While there, they discover their mother survived even though she became infected with the virus. She shows no symptoms but since she carries the disease, she can infect others – which Don discovers when he kisses her. This relaunches the virus as an active problem, one that the rest of the film follows. Like many movies, Weeks boasts an interesting premise but it fails to do a ton with it. I do like the idea, as it’s intriguing to follow up after such a major disaster and examine the aftermath. Yeah, we know that the authorities’ belief that the virus has gone away won’t be correct, as it wouldn’t be much of a flick without the semi-zombie action, but I enjoy the way the film develops a society that tries to rebuild. I also think that the depiction of a major character like Don as a coward is a good choice. At the start, we expect him to be the heroic lead, but that clearly doesn’t prove true. Although he doesn’t develop into a terribly deep character, at least he’s more interesting than most due to these complex elements. Unfortunately, Weeks doesn’t do as much with its premise and characters as I’d like. 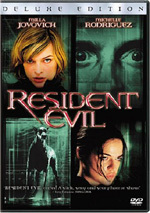 It takes almost half of the film’s running time to encounter the resurgence of the virus. That would be fine if the story used that time to adequately develop its characters and themes, but this doesn’t occur. The various pieces remain pretty sketchy despite the time available; they seem no more satisfying or full than if we’d only gotten half the development time. After all that, it comes as a disappointment that Weeks needs so long to build up to a story that essentially just echoes the first flick’s events. Again, it’s inevitable that we eventually encounter monsters, as that’s why we shelled out to see the flick. Nonetheless, I would’ve preferred better punch and creativity to the scenario. Another story concern stems from the choice to focus on Andy’s rescue. There’s nothing wrong with that basic concept, but Andy is such a dud of a character that we never care about what happens to him. In addition, the movie’s climax is pretty limp. The story just kind of ends, though we do get a coda that leads toward the possibility of another sequel. Stylistic choices don’t help. Weeks uses lots of hand-held “jerkycam” and slow-motion. Neither choice makes the film more involving or satisfying. Indeed, they may subvert the flick’s effectiveness, as they actively distract at times. While I can’t say that I actively disliked 28 Weeks Later, I thought it disappointed. The movie had potential to create an interesting extension of the original flick but it failed to develop much beyond a rehash of its predecessor. The film’s pleasures become outweighed by its faults. 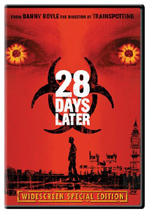 28 Weeks Later appears in an aspect ratio of approximately 1.85:1 on this single-sided, double-layered DVD; the image has been enhanced for 16X9 televisions. The transfer seemed unexceptional but good. Sharpness was usually fine. A little softness affected wider shots at times, but not to a substantial degree. Instead, most of the movie looked reasonably crisp and well-defined. Jagged edges and shimmering weren’t an issue, and edge enhancement was minimal. As for source issues, the film appeared somewhat grainy at times but other problems failed to materialize. Due to the drab palette chosen for the movie, colors looked fairly bland. Most of the time the film featured tones that intentionally were portrayed as pale and restricted. Within those constraints, the hues seemed fine. Blacks appeared fairly deep and dense, and shadows showed reasonable clarity and delineation, though they could be a little thick at times. This was a perfectly acceptable image but not one that excelled. I felt the same way about the Dolby Digital 5.1 soundtrack of 28 Weeks Later. Not a lot of real pizzazz came from the soundfield. That’s partially because we found little real action through the movie’s first half; not until around the 50-minute mark did it truly start to get into the mayhem. Once that happened, the audio opened up better. The front speakers remained dominant but the surrounds added a moderate amount of unique audio to flesh out the mix. No issues with audio quality emerged. The lines consistently sounded concise and distinctive, with no edginess or other issues. Music displayed good range and definition, while effects worked well. Those elements demonstrated strong clarity and punch throughout the movie. I didn’t think the track was ambitious enough for a grade above a “B”, but I couldn’t muster any real complaints about it. When we shift to the DVD’s extras, we begin with an audio commentary from director Juan Carlos Fresnadillo and producer Enrique Lopez-Lavigne. Both sit together for this running, screen-specific chat. They discuss camerawork, script and changes, the movie’s tone and what they wanted to bring to the film, locations and the depiction of London, music and editing, effects and stunts, cast and performances, and a mix of other production subjects. While I can’t find many reasons to criticize this commentary, I also can’t discover much reason to praise it. The chat remains pretty dry from start to finish. This means it covers the topics in a reasonable manner but never becomes very compelling or involving. It stands as a competent examination of the film that fails to engage. Two Deleted Scenes last a total of five minutes, 19 seconds. We find “The Canteen” (2:59) and “Andy’s Dream” (2:20). “Canteen” shows more of Don as he takes his kid through their new home, get some food and meet Scarlet. It sets up the concept that the virus may not be gone but does little else. In “Dream”, Andy has a reverie about his mom while he and Tammy flee through London. It adds nothing necessary. We can watch these with or without commentary from Fresnadillo and Lavigne. They give us a little background about the scenes and tell us why they cut them. Their notes gives us good insights about the segments. Next comes a program called Code Red: The Making of 28 Weeks Later. This 13-minute and six-second piece mixes movie clips, shots from the set, and interviews. We hear from Fresnadillo, Lavigne, producers Allon Reich and Andrew MacDonald, executive producer Danny Boyle, production designer Mark Tildesley, and actors Robert Carlyle, Jeremy Renner, Idris Elba, Imogen Poots, and Rose Byrne. The show looks at the development of the sequel and its story, the approach to the tale, shooting in London and visual design, casting and performances, Fresnadillo’s impact on the set, and general thoughts about the film. “Red” proves a little more informative than the average promotional piece, but it doesn’t offer a great deal of substance. I like the parts about possible sequel ideas, and a few other good nuggets emerge. However, there’s not much to the show, so don’t expect a lot of depth. The Infected lasts six minutes, 57 seconds and features Renner, Byrne, Fresnadillo, Poots, Elba, Carlyle, movement advisor Paul Kasey, costume designer Jane Petrie and actors Catherine McCormack and Mackintosh Muggleton. The program looks at the performances of the actors who played the movie’s monstrous characters and the execution of those roles. We get some decent info about this subject as well as nice behind the scenes footage. It’s a fun look at this unusual side of the acting coin, though there’s a little too much praise involved. Another featurette titled Getting into the Action fills seven minutes, 13 seconds with remarks from Renner, Byrne, Carlyle, McCormack, Fresnadillo, Poots, MacDonald, and Boyle. As implied by the title, this one looks at the action side of the flick. It discusses requirements for the main actors as well as shooting the various action scenes. Unfortunately, it doesn’t dig into these subjects well, as it stays pretty superficial. Two pieces under the banner of 28 Days Later: The Aftermath follow. We find “Stage 1: Development” (7:36) and “Stage 3: Decimation” (4:46). An unusual piece, that offers a filmed version of some Days graphic novels along with voice acting for the lines. It’s kind of a fun extra, as we watch alternate stories in the same universe. To some degree, it’s essentially just an ad for the books, but I still like it. The disc opens with a few ads. We get promos for Day Watch, and Sunshine. The DVD also features trailers for Weeks, 28 Days Later, The Hills Have Eyes 2, Lake Placid 2, Pathfinder, Perfect Creature and Wrong Turn 2. Though I didn’t think much of 28 Days Later, I held out hopes that its sequel would become an interesting piece. Unfortunately, 28 Weeks Later offered a pretty limp and forgettable action flick. It entertained at times but suffered from too many flaws to succeed. The DVD presents good picture and audio as well as a decent set of extras. I can’t complain about this release, but I can’t find much about the movie that makes it memorable.